BRYAN EATON/Staff photo. The New Hampshire Society for the Prevention of Cruelty to Animals spoke to third-graders at the Newbury Elementary School recently and the class decided to do some fundraising for the group. They held a sale Wednesday afternoon where they made bracelets, necklaces and book markers. 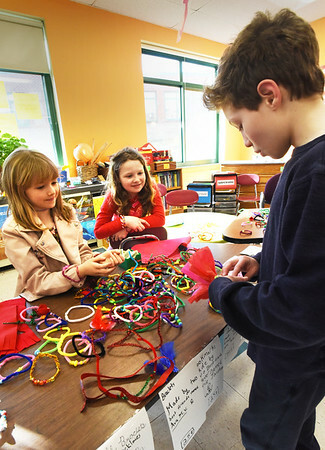 Checking out the items made by Ava Valianti, 8, left, and Annie Jacobsen, 9, is Joshua Krugman, 11.